Cluster Stud Earrings. Signity Diamond's are bright white man made diamonds with more sparkle than natural diamonds. Color Stones Change (White Topaz, Blue Sapphire, etc). As you must be wondering what is Signity Diamond and why you should buy them instead on Real Diamonds???. Fastening: Screwback | Solid Gold. Elegant solitaire stud earrings featuring two dazzling bright brilliant cut created diamond simulants totaling 2.50 carat. Basket Specifications Setting: 4-Prong Heavy Basket. Elegant solitaire earrings featuring round cut brilliant created diamonds. Heavy basket settings with secure screwback fastenings, all crafted from solid 14k white gold. High polished rhodium finish makes these classy earrings very bright and eye catching. Fastening: Screw-Back | 14K. Stamped: 14K. Diamond Specifications Cut: Brilliant | Round. Setting: Heavy Double Basket. Type: Created | Simulant. Setting: Heavy 3-Prong Martini. Stud Specifications All pictures you see are authentic and were shot by us. Type: Created | Simulant. Fastening: Screw-Back | Solid Gold. We will solve any issues and make sure you are 100% SATISFIED ! These stud earrings are Simple, Stylish and Fashioned. High quality Lab Diamond, 18K Gold filled on over. 925 Sterling Silver. • Material. 925 Sterling Silver / 18K Gold Filled. •Stone Type :Lab Diamond. Solid 18k white gold and excellent lab-created simulated diamonds. The 4-prong setting is distinctive and protective of the gem. Our gemstones replicate each array of light that a natural diamond does, comparable to D Color, VVS1 Clarity, & an Excellent Cut. Solid 14k yellow gold and excellent lab-created simulated diamonds. The Bezel setting is distinctive and protective of the gem. Our gemstones replicate each array of light that a natural diamond does, comparable to D Color, VVS1 Clarity, & an Excellent Cut. These beautiful and resilient simulated diamond stud earrings are constructed out ofsolid 14k yellow gold and brilliant simulated canary yellow diamond. They emanate every shade of light that a natural diamond would. 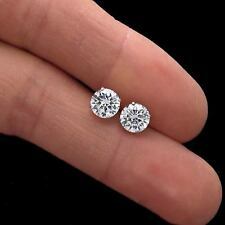 1.00 Carat Round Brilliant Cut Solitaire Stud Screw Back Basket Earrings in Solid 950 Platinum. These exquisite simulateddiamond stud ear rings are crafted out of solid 950 Platinum and brilliant simulated diamonds. Solid 14k white gold and excellent lab-created simulated diamonds. The 4-prong setting is distinctive and protective of the gem. Our gemstones replicate each array of light that a natural diamond does, comparable to D Color, VVS1 Clarity, & an Excellent Cut. 3.0 Ct Blue Round Earrings Studs Solid 14K White Gold Brilliant Screw Back. solid 14k white gold and excellent lab-created simulated diamonds. The 4-prong setting is distinctive and protective of the gem. 3.0 Ct Green Round Earrings Studs Real 14K White Gold Brilliant Screw Back. 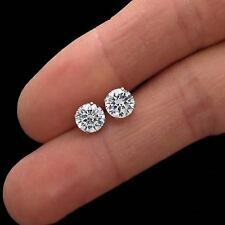 simulated diamond stud earrings are constructed out ofsolid 14k white gold and brilliant simulated diamonds. They emanate every shade of light that a natural diamond would. (Give Yourself a Sparkle – Martini Stud Earrings. •Style: Martini Stud Earrings. •Setting: 3-prong Martini style setting. If You Want to Make Sure You'll Never Lose Another Earring Ever Again You Must Use Screw Backs). 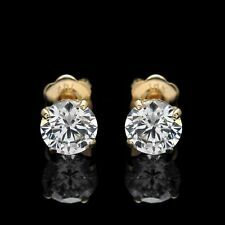 1.50 Carat Round Brilliant Cut Solitaire Stud Screw Back Basket Earrings in Solid 950 Platinum. These exquisite simulateddiamond stud ear rings are crafted out of solid 950 Platinum and brilliant man-made simulated diamonds. These beautiful and resilient simulated diamond stud earrings are constructed out ofsolid 18k white gold and brilliant simulated diamonds. They emanate every shade of light that a natural diamond would. Gem Type:- Lab Created. Center Stone:-0.00. Total Carat:-1.50 ct. Clarity VVS1. Style Stud. Type Earrings. Main Stone Diamond. Diamond Color D. Main Stone Shape Round. Country/Region of Manufacture United States. If the information does not match, your order may be canceled. 4.00 Carat Canary Yellow Round Brilliant Cut Solitaire Stud Screw Back Martini Earrings in Solid 14K Yellow Gold. These exquisite simulateddiamond stud ear rings are crafted out of solid 14k Yellow Gold and brilliant man-made Canary Yellow diamonds. 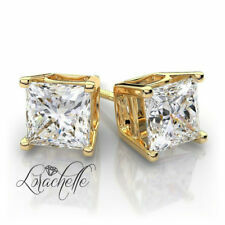 2.50 Carat Princess Brilliant Cut Solitaire Stud Screw Back Basket Earrings in Solid 950 Platinum. These exquisite simulateddiamond stud ear rings are crafted out of solid 950 Platinum and brilliant man-made diamonds. 1.50 Carat Blue Round Brilliant Cut Solitaire Stud Screw Back Basket Earrings in Solid 950 Platinum. These exquisite simulateddiamond stud ear rings are crafted out of solid 950 Platinum and brilliant blue simulated diamonds. These exquisite simulateddiamond stud ear rings are crafted out of solid 18K White gold and brilliant simulated diamonds. This design of stud earrings is one of the most desired and classy of all. They are set in a unique, secure, 4-prong basket designer style setting. 3.00 Carat Canary Princess Cut Solitaire Stud Screw Back Basket Earrings in Solid 14K White Gold. These exquisite simulateddiamond stud ear rings are crafted out of solid 14k white gold and brilliant man-made diamonds. Signity Diamond's are bright white man made diamonds with more sparkle than natural diamonds. 14K White Gold. Stud Earring. They are bright and sparkly and display more fire than the best grade of diamonds as shown in the table below. 3.00 Carat Asscher Brilliant Cut Solitaire Stud Screw Back Basket Earrings in Solid 14K White Gold. These exquisite simulateddiamond stud ear rings are crafted out of solid 14k white gold and brilliant man-made diamonds. We will try our best to help you. If you have any queries about the product/service expect a reply within 48 hrs.